W.P. 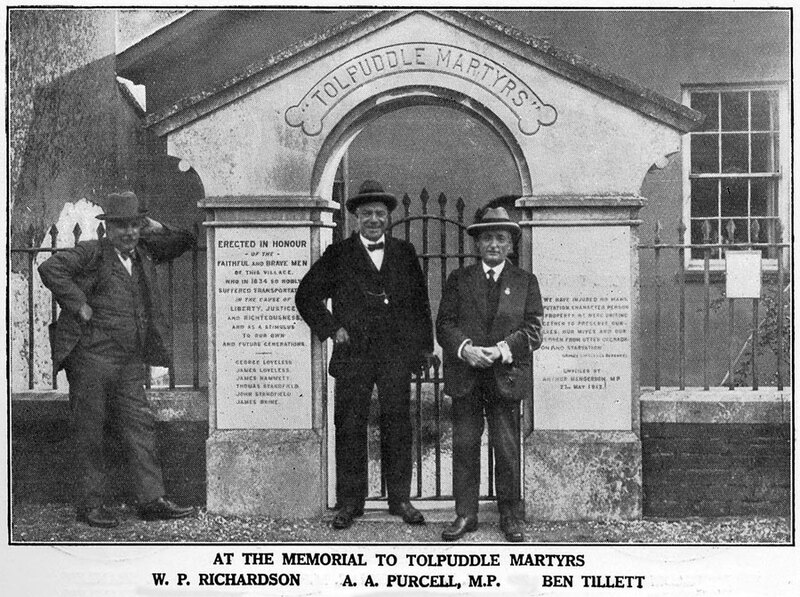 Tolpuddle Martyrs / P.M.
Pictured during The General Strike, 1926. 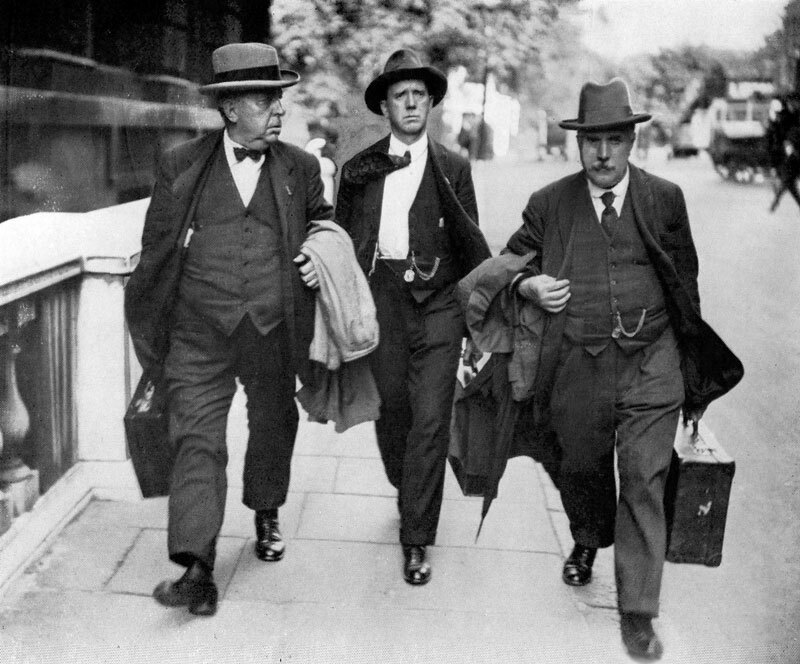 Herbert Smith, A. J. Cook and W. P. Richardson on their way to Downing Street, 26th August 1926. 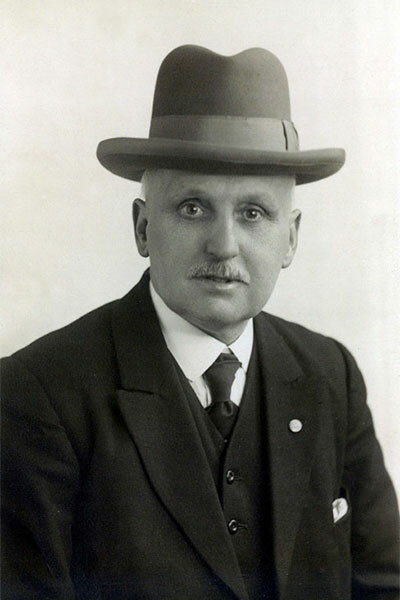 Herbert Smith: President of the Miners' Federation of Great Britain, 1922 to 1929. Arthur James Cook: General Secretary of the Miners' Federation of Great Britain, 1924 to 1931. 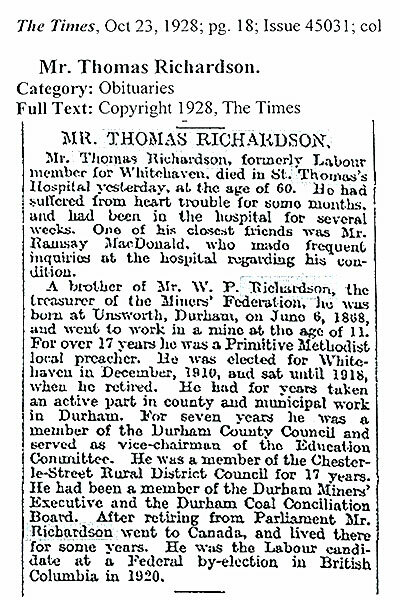 William Pallister Richardson: Branch Secretary of Usworth Colliery Lodge. Later, Treasurer of Miners' Federation of Great Britain, 1921 to 1930. 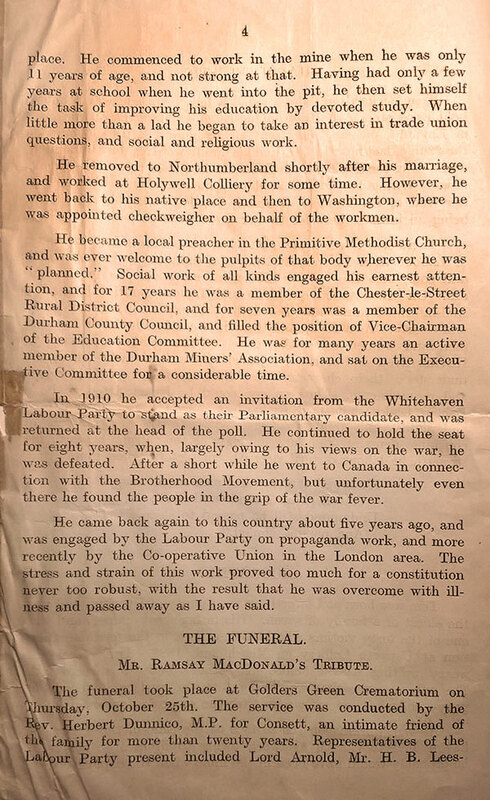 General Secretary of Durham Miners' Association, 1924 to 1930. 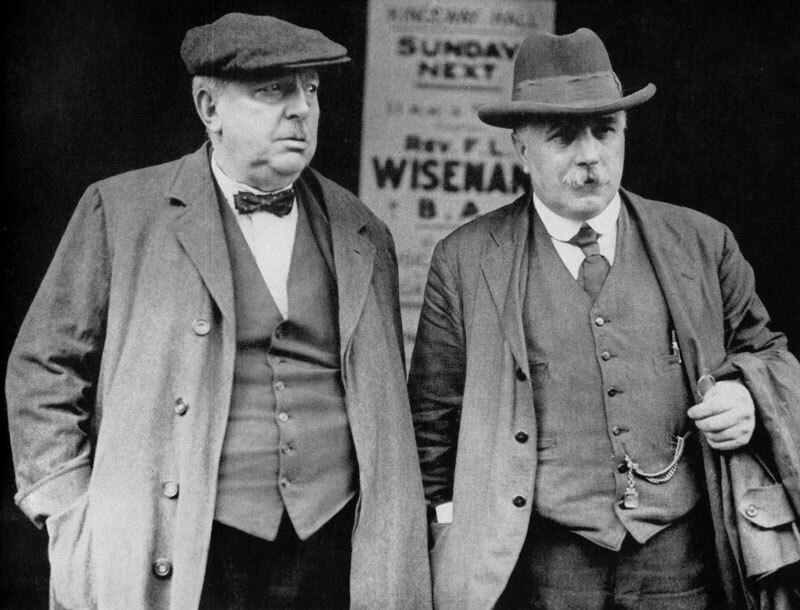 Herbert Smith and W. P. Richardson, 14th May 1926. Pictured at Tolpuddle Martyrs Memorial Arch. A. A. Purcell: MP from 1923-24 & 1925-29. 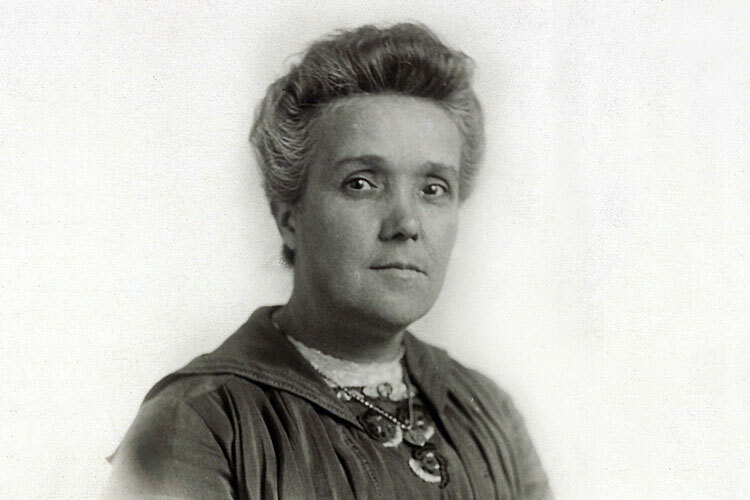 President of the International Federation of Trade Unions, 1924 to 1928. Ben Tillett: MP from 1917-24 & 1929-31. 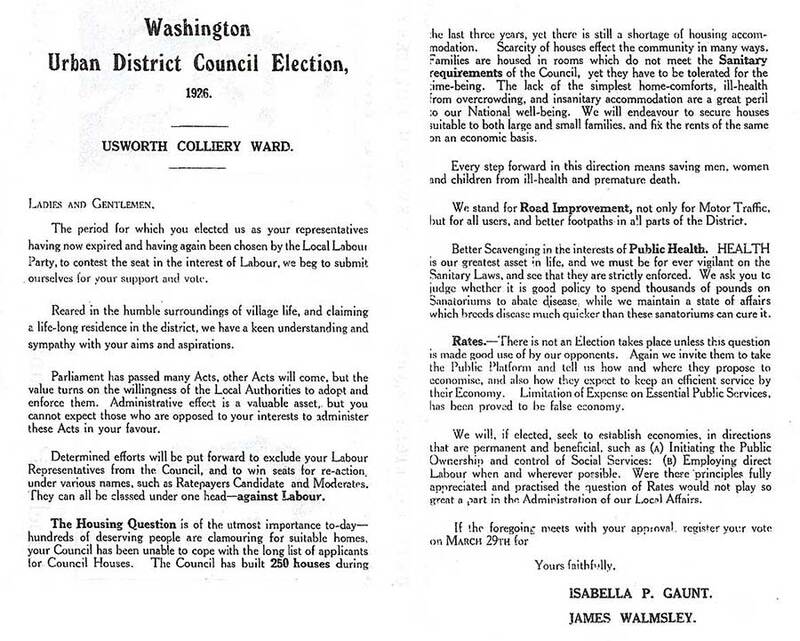 President of the Trades Union Congress in 1929. 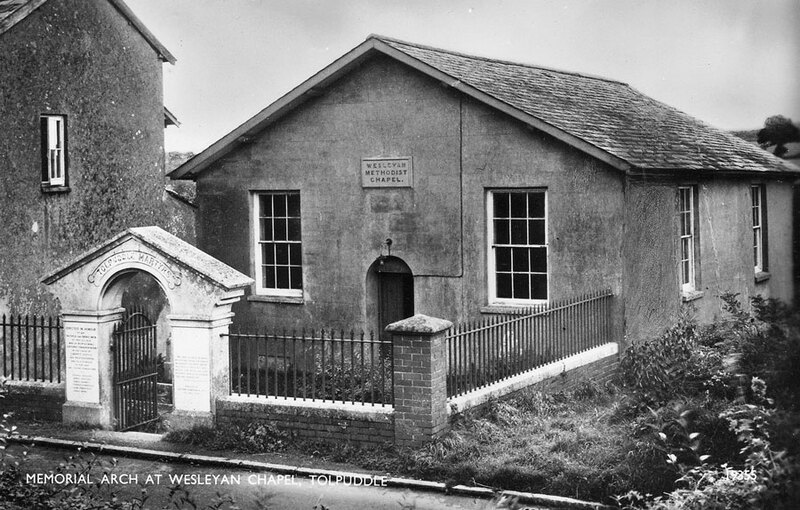 Wesleyan Methodist Chapel, Tolpuddle, Dorset. and convicted of, swearing a secret oath as members of the Friendly Society of Agricultural Labourers. They were transported to Australia and subsequently pardoned following a massive public outcry. Bill says, "The Tolpuddle visit probably took place in 1926. That's the year the TUC Congress was held at nearby Bournemouth, 20 miles away." Pictured at the TUC Congress, Bournemouth 1926. 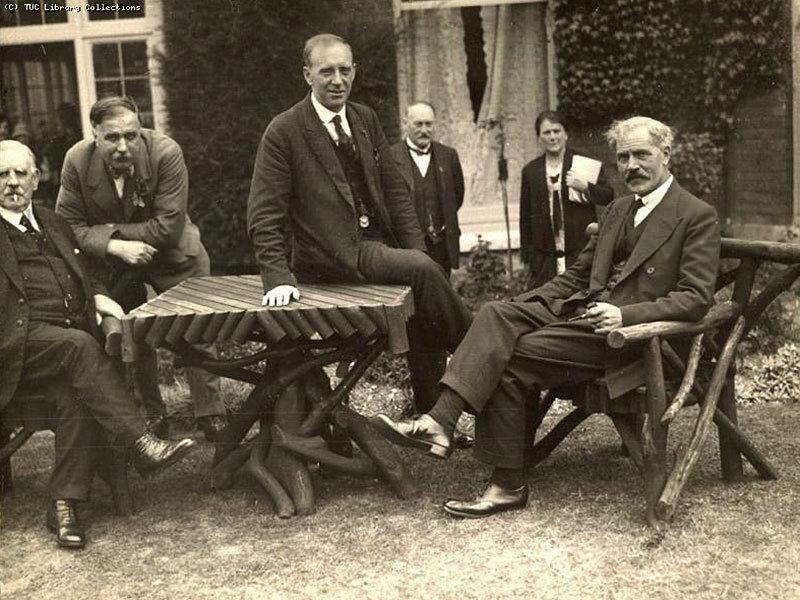 An informal moment at the TUC Congress, Bournemouth 1926. Thomas Richards: Welsh trade unionist and MP from 1904 to 1920. Government from 1931 to 1935, dominated by the Conservative Party. Married Isabella Pallister Richardson in 1894. 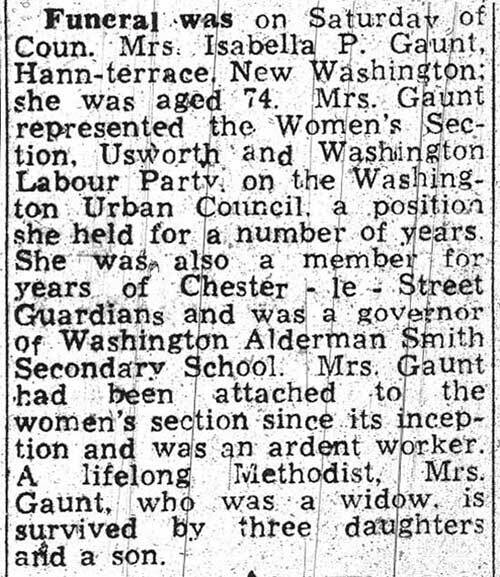 Born 1869 - Married coal miner Leinan Gaunt in 1894 - Died 1944. Born 1st April 1897 - Married George Davis in 1924 - Died 1962. Born 2nd Quarter 1900 - Married Mary Newton in 1924 - Died March 1958. Born 23rd March 1903 - Unmarried - Died 3rd May 2001. A Third Daughter - Born 1911. Tom was W.P. 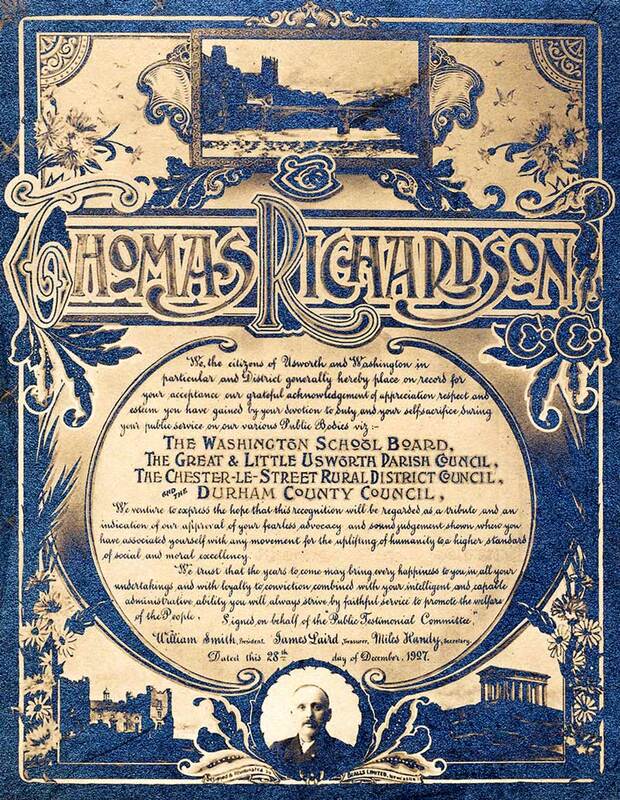 Richardson's elder brother and, at the age of eleven, worked as a Trapper Boy at Usworth Colliery. He was responsible for opening and closing pairs of ventilation doors in the correct manner - to assist the passage of miners, ponies, coal tubs etc., without causing disruption to the normal flow of the mine's ventilation system. 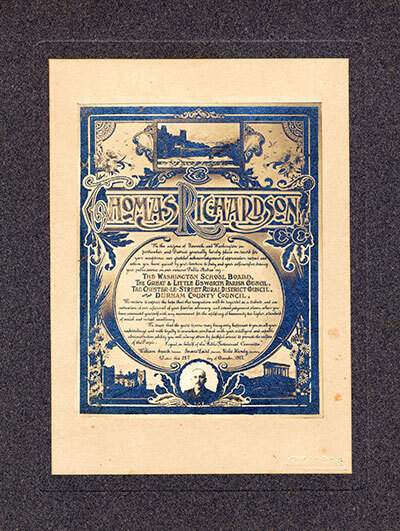 On the day of the 1885 Usworth Colliery Disaster, which killed his father, Robert, and 41 other miners, Tom had taken the day off. 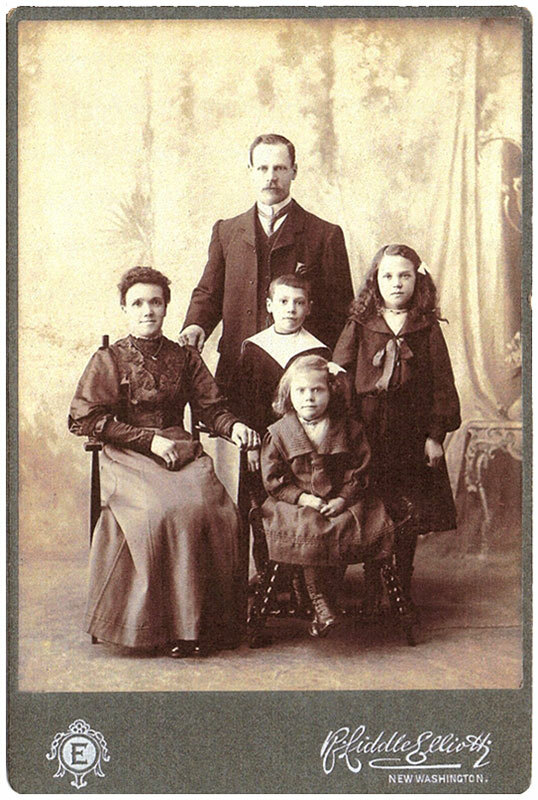 On 31st January 1888, Tom married Mary Ellener (Nellie) Purvis (1868-1947), the daughter of John Purvis, a farm hand. Tom and Nellie had ten children but, like his brother W.P. and wife Esther, Tom and Nellie had to suffer the loss of 4 children in infancy, and one as a young woman. Robert and Margaret Richardson's Family were all given a religious upbringing and Tom was a Primitive Methodist Preacher for many years. 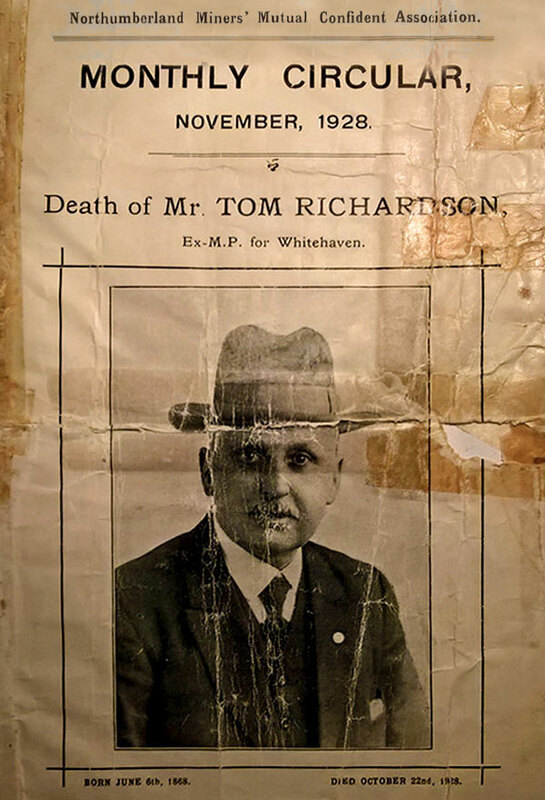 Thomas Richardson contested the Whitehaven seat in the general election of December 1910, sponsored by the ILP - it was held by the Conservative Party. He won the seat and made his maiden speech in the House of Commons in March 1911, calling for an increase in the number of Mine Inspectors. He referred to Whitehaven's Wellington Pit Disaster of May 1910, when 136 men and boys had been killed by an underground explosion and subsequent fire. He made no mention of his father's death in similar circumstances at Usworth while he (Thomas), a fellow Usworth miner, was only 16 years of age. 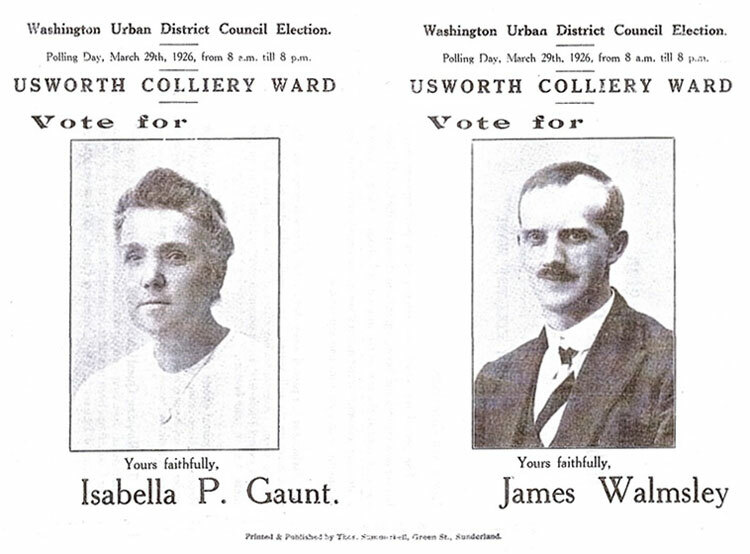 Tom contested the Bosworth, Leicestershire seat in 1918 and was beaten by the Coalition Liberal candidate H.D. McLaren. McLaren had been awarded a CBE for his work at the Ministry of Munitions, while Richardson had taken a public anti-war stance. He continued to work for the labour movement but by the late 1920s his health began to deteriorate. He died of heart failure at St. Thomas's Hospital, London, having been in hospital for several weeks with heart trouble. 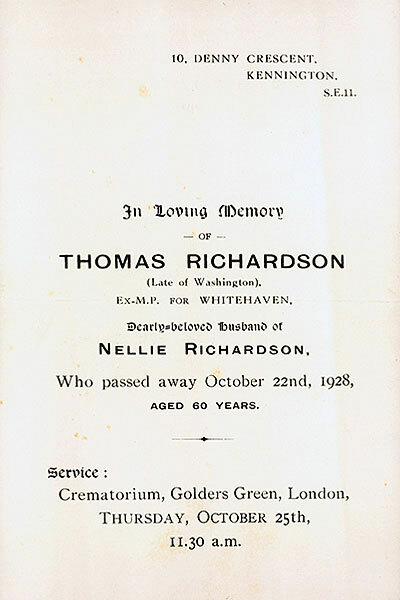 Thomas Richardson was buried in Streatham Vale cemetery. 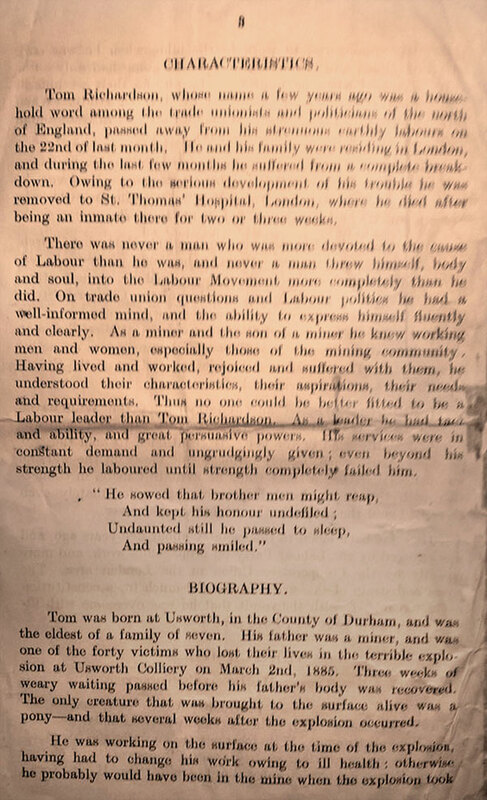 Tom Richardson worked closely with a number of prominent men in the early labour movement. 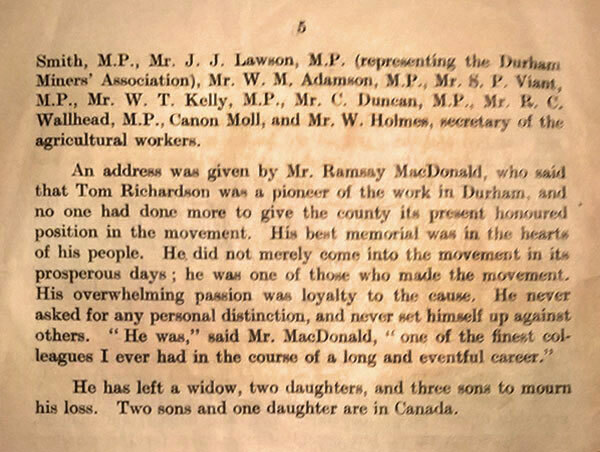 He was a close friend of Ramsey MacDonald, who gave an address at his funeral. The respect Tom Richardson had for these men is reflected in the names given to two of his sons, Thomas Hardy Richardson, born in 1905, and Robert MacDonald Richardson (known as Donald), born in 1910.